As you all know, December abounds with holiday celebrations, but nothing can spoil good cheer like an emergency trip to the veterinary clinic. 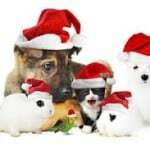 These tips can help keep your winter holiday season from becoming not so happy for your pet and for you. Chocolate, coffee, and tea all contain dangerous components called Xanthine’s, which cause nervous system or urinary system damage and heart muscle stimulation. Chocolate, with theobromine, is especially a problem because dogs love its flavor. Problems range from diarrhea to seizures and death. Unsweetened baking chocolate and dark chocolate are the worst culprits, but chocolate, fudge and other candy should be placed out of your dog’s reach. Other sweets and baked goods should also be kept out of reach. Not only are they often too rich for pets; an artificial sweetener often found in baked goods, candy and chewing gum, xylitol, has been linked to liver failure and death in dogs. Table scraps – including gravy and meat fat –also should be kept away from pets. Many foods that are healthy for people are poisonous to pets, including onions, raisins and grapes. During the holidays, when our own diets tend toward extra-rich foods, table scraps can be especially fattening and hard for animals to digest and can cause pancreatitis and damage to the kidneys. Macadamia nuts contain an unknown toxin, which can damage the kidneys. Meat soaked strings from rump roasts are also enticing. Ingestion can cause a surgical emergency called a “linear string foreign body” in the intestines. Identification tags and microchips reunite families. Make sure your pet has proper identification with your current contact information – particularly a microchip up-to-date, registered information. That way, if they do sneak out, they’re more likely to be returned to you. If your pet isn’t already microchipped, talk to your veterinarian about the benefits of this simple procedure. Whether you take your pets with you or leave them behind, take these precautions to safeguard them whenever you’re traveling. Pets in vehicles should always be safely restrained and should never be left alone in the car in any weather. Proper restraints using a secure harness or a carrier, placed in a location clear of airbags. Never transport your pet in the bed of a truck. Pack for your pet as well as yourself if you’re going to travel together. In addition to your pet’s food and medications, this includes bringing copies of their medical records, information to help identify your pet if it becomes lost, first aid supplies, and other items. Quick action can save lives. If you believe your pet has been poisoned or eaten something it shouldn’t have, call your veterinarian immediately. Remember – signs of pet distress include: sudden changes in behavior, depression, pain, vomiting, or diarrhea.